Home / Blog / What do Small Businesses Know About SEO? SEO is a digital marketing term that most small business owners have heard. They know it relates to websites and Google. But beyond that, how much does the average small business marketer really know about SEO or search engine optimization? We surveyed 500 people who said they were part of a small business’s marketing efforts to find out. What we discovered is that many small businesses don’t have a complete understanding of SEO. Despite the benefits of ranking well in search engines, many small businesses are missing the mark when it comes to implementing strategies that will boost their SEO. 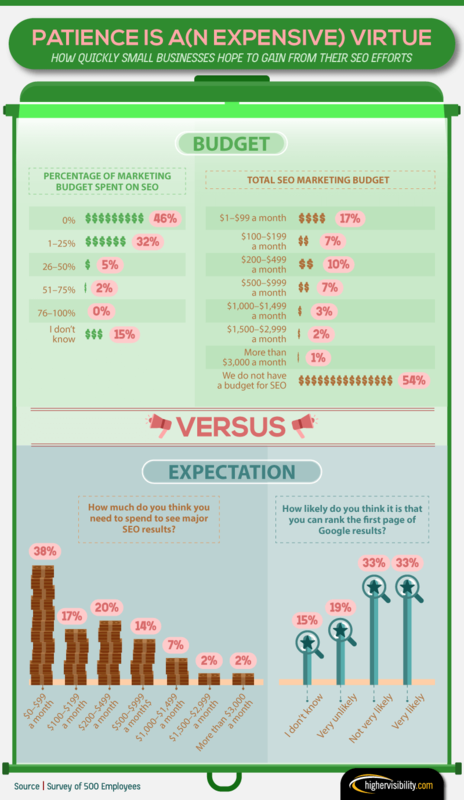 Fifty-four percent of respondents said they don’t have a budget for SEO services. Thirty-eight percent said they believe keyword stuffing (which is a negative SEO tactic that could lead to penalties in search rankings rather than improvements) is a good thing. And 20 percent said they don’t even have a website. Many small business marketers don’t understand the value of investing in their web presence and SEO, or they have false information that is driving their strategy in the wrong direction. As a small business owner or marketer, are you making the same mistakes? Use the rest of this post to identify the opportunities and errors you could be missing in your strategy. Failing to understand SEO is problematic for small businesses because it limits their ability to rank. It’s even more problematic because using the wrong SEO strategies can penalize a website and decrease its rankings. Good SEO improves a website’s ability to rank on search engine results pages (SERPs). Bad SEO can cause a website to fail to rank at all. While most small business marketers understand these are negative practices, there are still some who believe in these bad habits. 38 percent incorrectly believe keyword stuffing is a good way to rank for a keyword. 12 percent incorrectly believe it’s OK to publish duplicate content that has been copied and pasted from another website or page. Some small business marketers also have incorrect expectations for how SEO works. While 89 percent do understand some keywords are harder to rank for than others, 29 percent incorrectly believe a website should start ranking as soon as it’s published. The survey highlights more examples of how small business marketers lack SEO knowledge. When asked about the importance of specific SEO strategies, most respondents didn’t know how important they were. 21 percent didn’t know how important blogging and content creation was to SEO. 26 percent didn’t know how important on-site optimization was to SEO. 24 percent didn’t know how important local search optimization was to SEO. 25 percent didn’t know how important link building was to SEO. 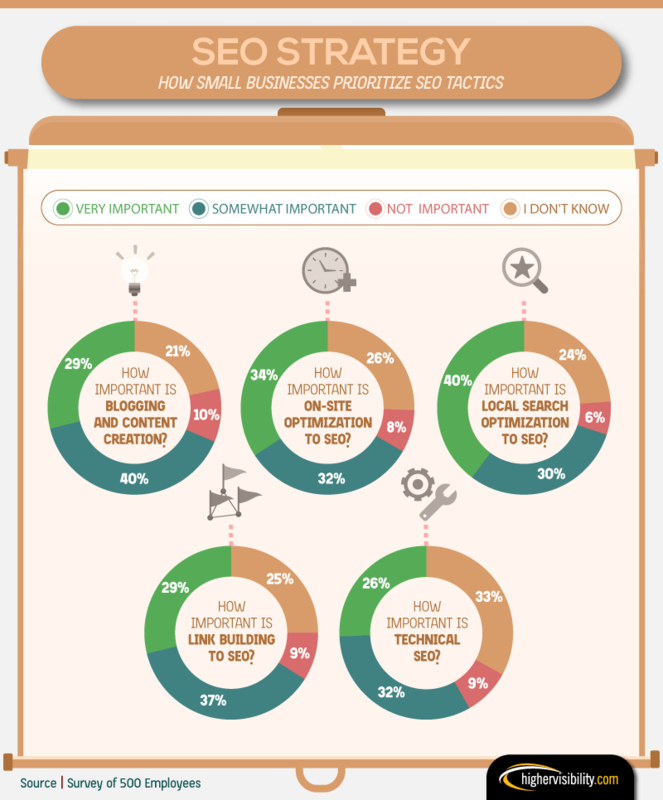 On average, a quarter of small business marketers were unfamiliar with the strategies that are best practices for SEO. In some cases, respondents even said strategies that are important SEO components were not important at all. 10 percent said blogging and content creation was not important to SEO. 9 percent said link building was not important to SEO. 8 percent said on-site optimization was not important to SEO. While many respondents correctly agreed local search engine optimization is very important (40 percent), only 29 percent said that link building is very important. 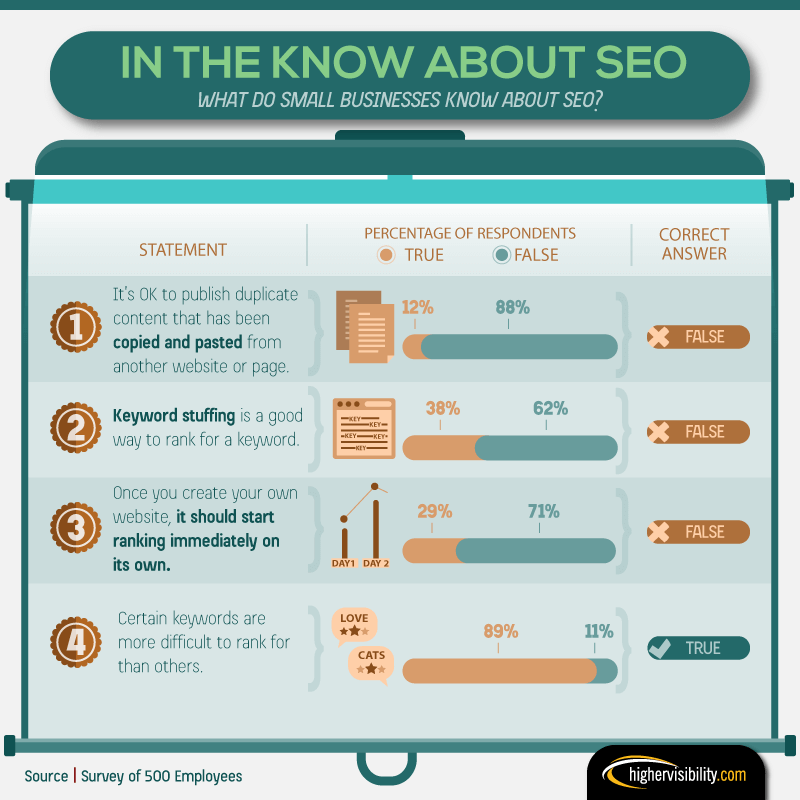 There are still many SEO misconceptions among small business marketers. In addition to not fully understanding SEO, many respondents aren’t spending money on their search engine optimization strategy. More than half of survey respondents aren’t investing in SEO. Only 46 percent spend part of their monthly budget on SEO efforts, and a majority of those who do spend money on SEO (38 percent) spend less than $100 a month. 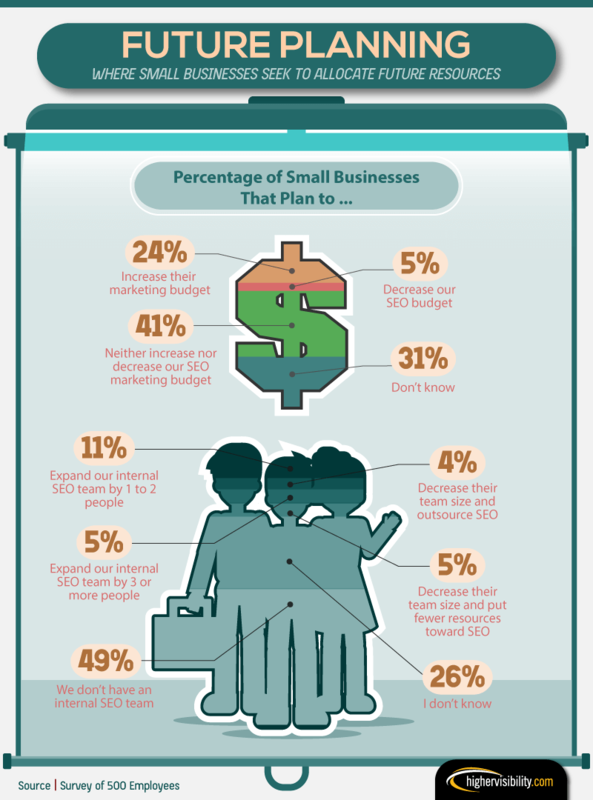 Small businesses aren’t spending much on their SEO, although most believe they should. Fifty-one percent of respondents said they think they need to spend somewhere between $100 to 1,000 a month. While many small businesses with a website see the value in regularly updating their website’s framework and content, there are still some who don’t. Thirty-three percent have not updated their website’s framework or design in more than a year, and 7 percent haven’t updated in three or more years. Further, 11 percent didn’t know how often they should add new content, and 12 percent said they should never add new content or only add new content a few times a year. While many aren’t updating their online presence, those who are were happier with their appearance in search rankings than those who weren’t. 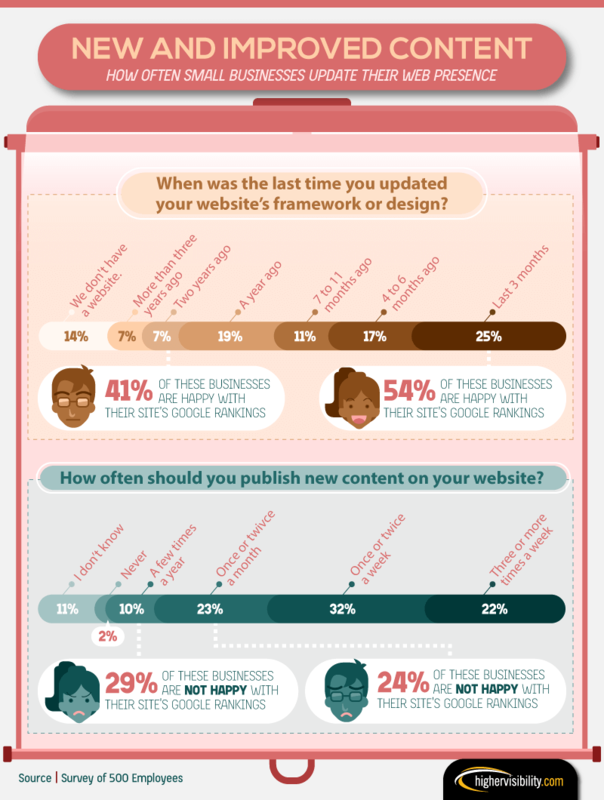 Finally, 54 percent of those who updated their site in the last three months were happy with their site rankings, while only 41 percent of those who haven’t updated in the past two years were happy with their rankings. While a majority of small businesses have Facebook profiles (72 percent), most are not very active on social media platforms. Only 40 percent are on Twitter, 27 percent on LinkedIn, and 24 percent on Instagram. 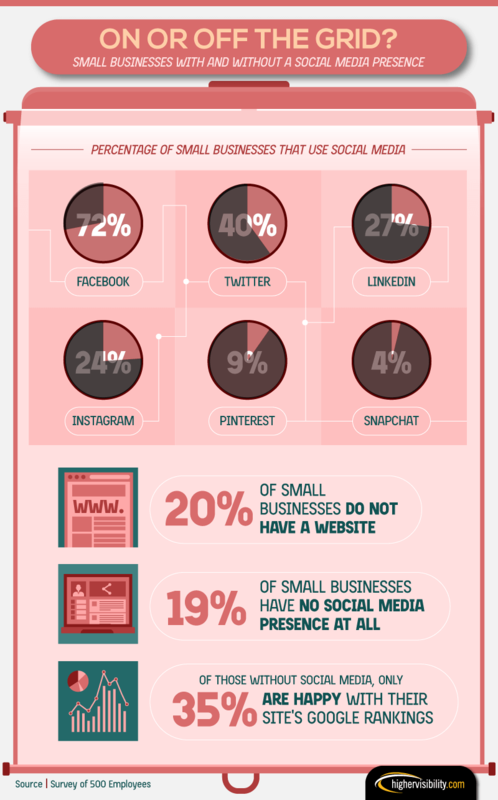 Almost a fifth of small businesses (19 percent) have no social media presence at all. Because social media may send positive SEO signals to search engines, it’s no surprise that of the businesses without a social presence, only 35 percent are happy with their site’s Google rankings. A social media presence is a part of a healthy SEO strategy, yet many businesses are failing to implement this piece of the puzzle. When we looked at how small business marketers were planning for the future, we found that many didn’t know what direction to go with their SEO budget. In fact, 31 percent didn’t know if they would increase, decrease, or keep the same budget, while 41 percent said they would keep the same budget. Although, those with an internal SEO team (who may have a better understanding of the value of SEO) are planning to add more resources rather than take them away. Lastly, 16 percent of respondents said they have an internal team and are planning to expand that team by one or more people, while only 5 percent said they have an internal team and are planning to decrease the team and put fewer resources toward SEO. As it stands, there is still some confusion and missed opportunities in the way that small businesses approach SEO. While small business marketers seem to understand that SEO is something they need to use, many still fail to implement the correct strategies that will help improve their search rankings. Don’t fully understand how SEO works. Don’t realize why SEO is important. Fail to connect the dots between SEO and social media, blogging and content creation, and link building. Don’t understand the value and importance of having a regularly updated and fresh website. Aren’t investing enough in SEO strategy. Know that they should invest more in SEO, but aren’t sure how. The good news is small businesses who make SEO a priority have an opportunity to get ahead of the curve and stand out from their competitors who are failing to see the potential in investing in SEO. Starting an SEO strategy may allow small businesses to capitalize on search, move ahead of the competition, and connect with customers where others are failing to make an impression. We surveyed 500 people who said they were part of a small business’s marketing efforts. Know someone who could benefit from knowing a little more about SEO? Feel free to share the contents of this project for non-commercial purposes, as long as you link back to the authors of this page.